The Mission Support Center (MSC) is the modern version of mission control we know from the Lunar Landings: it serves as a control center, which supports the teams in the field, but also acts as a “Gateway to Mars” for scientists, the media, and the general public. Due to the amount of time it takes for information to travel between Mars and Earth (this can be anywhere from 3 to 22 minutes depending on the specific constellation), control in real time is out of the question. The team members in the field must make their decisions autonomously and create their own schedule. This has been shown to allow astronauts on long missions to work more effectively. The Forum’s MSC is a unique facility which allows for the testing of various concepts. The most important part of this facility is the Flight Control Room (FCT) where the Flight Director orchestrates the Flight Control Team. All the essential telemetric data is collated in the FCT, communicated to the team in the field, and then decisions are made. This part of the MSC is traditionally the closest to the mission. 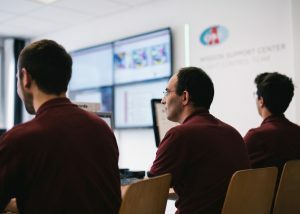 The FCT is supported by several “Back Rooms”: these are staffed with teams who work for the FCT, prepare decisions, or analyse data in (near) real time. 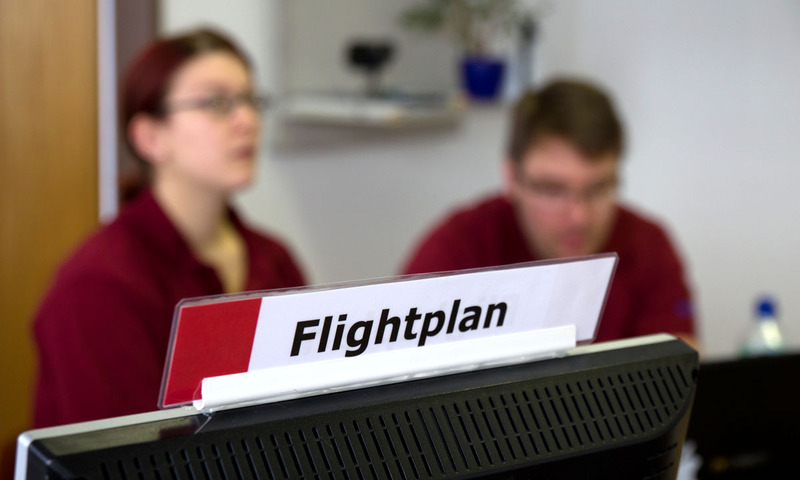 Flight-planning is responsible for creating a schedule of field activities, wherein safety aspects, route planning, weather forecasts, or individual needs of the scientists must be considered as well as any used goods, human factors, or the needs of the crew. The team with Remote Science Support (RSS) is mostly interested in the data the field crew records and collects, and this team analyzes this data very quickly. This enables the RSS to provide suggestions for flight planning. The RSS team therefore has the time for professional discussions, detailed study of data, and also the consultation with external experts. The team in the field can concentrate on survival, hardware maintenance, and the execution of activities planned for them on Earth. Flight Planning console – an essential element within the MSC to support the field crew. The third group is the “earthbound” component of the MSC: it covers public relations and ground support with one IT-department. Most missions of the Forum get strong interest from the media, be it traditional media like TV and papers, but also within Social Media. During the Space Week Mission, the team could reach 17 million people just via Twitter. Ground Support allows for a hassle-free course of events of the work of the MSC – beginning from catering, logistics, and security. The electronic division of Ground Support is the IT department: the success of the MSC depends on a perfectly working, complex network. External control centers can be added, telemetry data can be sent to collaborators at NASA and saved within the Forum’s own archive. Lead time for a large field test can be up to two years: this includes recon missions as well as negotiations with local and national authorities, the drawing of contracts with partners and the “Announcement of Opportunity,” which allows external researchers suggest ideas for experiments. Of high importance is also the collaboration between research institutes and space agencies – for example, 23 nations were involved in the MARS2013-expedition. The MSC Flight Operators – lead by the Flight Director- often have to take important decisions under pressure. The Forum teaches necessary skills. An essential part of the preparation is the identification of competent partners from industry who can contribute towards the success of the mission with both Hardware and Know-How. Past partners included, for example, LANCOM (produces W-LAN equipment), Katja Zanella-Kux (professional expedition photographer), or staff responsible for bookkeeping, legal services, and strategic communication. However: No mission can be successful without a highly motivated team. A careful selection of mission specific specialists – mainly volunteers or seconded from research institutes – is an important recipe for success. Volunteers receive compact training before taking up their work in the FCT or explore the “Red Planet” as an analogue Astronaut.